Smart, funny, and thought-provoking, this book shows feminist parents how to navigate their daughters' princess-obsessed years by taking a non-judgmental and positive approach. Devorah Blachor wrote the 'Coming to America' parenting column for the New York Times Motherlode and also writes for The Huffington Post, McSweeney's, The Hairpin, Redbook, Mommyish, Good Housekeeping and The Rumpus, among other websites and magazines. Her children Cai and Mari provide endless material for her humor and essays. "Blachor's The Feminist's Guide to Raising a Little Princess is a fun, informative read peppered with funny anecdotes and informative thoughts on things like the value of embracing the feminine, American optimism, and maternal healthcare. (There's also a chapter that will feel all too familiar to any parent that's ever taken their toddler to Disneyland Paris and immediately regretted it). This is a book about what it means to be a feminist and trying to raise a feminist daughter who happens to be obsessed with the color pink, frilly dresses, and also being a princess. It's also about why you can't blame Disney. Even if you really, really want to." "Devorah Blachor deftly weaves personal stories with research and clever humor in The Feminist’s Guide to Raising a Little Princess. This funny and relatable book Is perfect for any imperfect parents who find things not going according to their parenting plans." "I happen to be the mother of a boy, but I have many friends who are both feminists and parents of pink-obsessed girls. I wholeheartedly recommend they read Devorah Blachor's The Feminist Guide to Raising a Little Princess. It's hilarious, wise, relatable, and insightful. I snort-laughed more than once while I read it. Before I even finished it, I started telling friends 'You have to read this book - you'll love it'." 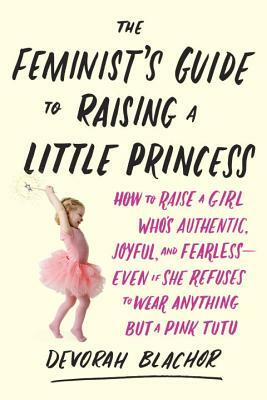 "I adored Devorah Blachor's "The Feminist's Guide to Raising a Little Princess." It's a rare book that combines "serious" science with hilarious "opposite of serious" stories that bring the point of the "serious" science home in a completely relatable way. For feminists with pink-and-princess-obsessed preschoolers who wonder where they went wrong, Blachor reassures you that it's not you -- it's them! There's hard wiring that makes your child the way she is. I wish this book had been around when my daughter was small. I'll be sharing it with friends who are mystified by the little princesses in their own lives." "The struggle is real. As a fellow feminist and mother of a young daughter, I too have battled the Princess Industrial Complex, but have been beaten down by tiaras and tutus. This hilariously funny book is a guide to tackling pink-glitter-bomb-fluffiness and #winning. Best of all, Devorah Blachor's common-sense talk teaches us how to counteract harmful messages while allowing our daughters to become their own people."